Spend much time watching streaming video? How do your YouTube watching tastes size up against the rest of the nation? Now, thanks to the YouTube Trends Map, you can take a look at which videos are the hottest in your part of the country – and all across America. The new map is more revealing than you’d immediately think. It shows off a huge cultural split across the country. In heavily Republican Twin Falls, Idaho, a video of Glenn Beck knocking Obama is the most shared; the South and Midwest prefer the country styling of Alan Jackson and Blake Shelton, respectively. And in pop-media-savvy New York City and Los Angeles, a promo video for a new Russian band called The Clood is going viral. 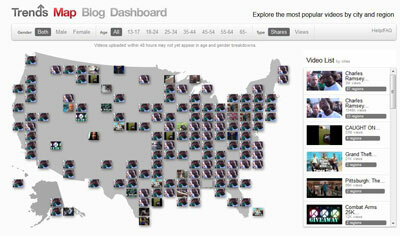 Even cooler still, you can spot a few highly localized videos on the map. Minnesota viewers are going crazy over a video showing two lynx spotted by Sawbill Lake in the state. Louisiana’s top pick is a highlight reel for LSU’s recently drafted Eric Reid. And the award for the most enjoyable local video in the nation goes to Oneonta, New York’s video We Are Oneonta, an extremely well produced video showing off what the city of 14,000 has to offer, from restaurants to roller derby. The YouTube trends dashboard also lets see what other demographics are watching. Female viewers, for example, are watching True Blood’s Season 6 Trailer more than any other video. And for those aged 35-44, the most popular video is the latest from Queens of the Stone Age, a band that formed 17 years ago. If you’re wondering what’s topping the charts in your neck of the woods, you can visit the YouTube trends map at www.youtube.com/trendsmap. And let us know what’s hot where you are in the comments!